It is fast, furious and freezy! Singapore's famous liquid nitrogen ice cream is whipping SM City Marilao into a frenzy with the recent opening of G9 Molecular Ice Cream. 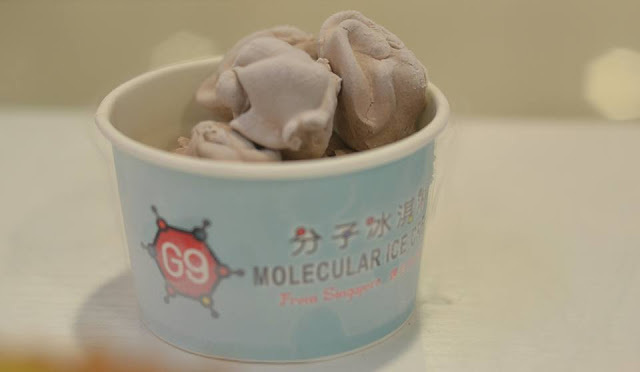 Bringing the element of surprise and delight back at the gastronomical world of ice cream, G9 Molecular Ice Cream offers Singapore's trendy frozen dairy treat. What makes this frozen delight different from burgeoning ice cream segment is the entire procedure of making it. Each treat is made upon order with ice cream paste flash-frozen with liquid nitrogen. In a fraction of 60 seconds and at a temperature of -196 degrees Celsius, liquid paste freezes giving it a smooth, cream texture beyond traditionally hand-scooped ice cream. A visit at their new store will surely give all ice cream fans a spectacular liquid nitrogen smoke show while guaranteeing unique taste of freshness and flavor. Besides the sweet frozen conconctions, G9 Molecular Ice Cream also serves delectable and avant-garde ice creams. Customers may choose from their plethora of exquisite flavors ranging from all-time favorites cookies and cream, durian milk, to their latest dessert flavor, sea salt caramel. G9 Molecular Ice Cream is located at the second floor of SM City Marilao. The company was founded in Singapore in 2013 and currently has more than 200 stores all over Asia! It's awesome to visit this web page and reading the views of all friends concerning this piece of writing, while I am also keen of getting know-how.